The weather is becoming perfect. And once again we stumbled upon boulder treasure. Several new high quality boulders and problems came out of this past weeks’ efforts out in Disappointment Valley. This photos was taken of friend Paul on Tumble Weed V3+ (a good warm up for the area). The beginning of the route starts about five body lengths lower down on the boulder—sit start. 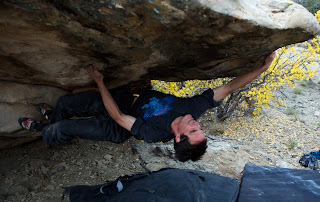 The underside of the boulder offers many V2 moves before heading out over the top (crux). The days out there are some of the best you could ask for—magic, new problems on new boulders, … one day after the next—we are lucky!